At home, I would never have noticed the astonishing second-day deliciousness of a mass-market sparkling wine. The wine was blah the first day so, spoiled as I am, I would have poured whatever was left down the drain. But we were not at home. We were in Pelileu, an island in the south of Palau known to most as the site of a long and particularly bloody WWII battle, and to us as the base for some of the world's best scuba diving. There's not much on Pelileu other than rusted tanks and leftover armaments and palm trees and biting insects. But underwater, we saw a shark dentistry. Above a certain knob of coral in the German Channel, small cleaner wrasse fish await clients, in this case gray reef sharks and white tip reef sharks. 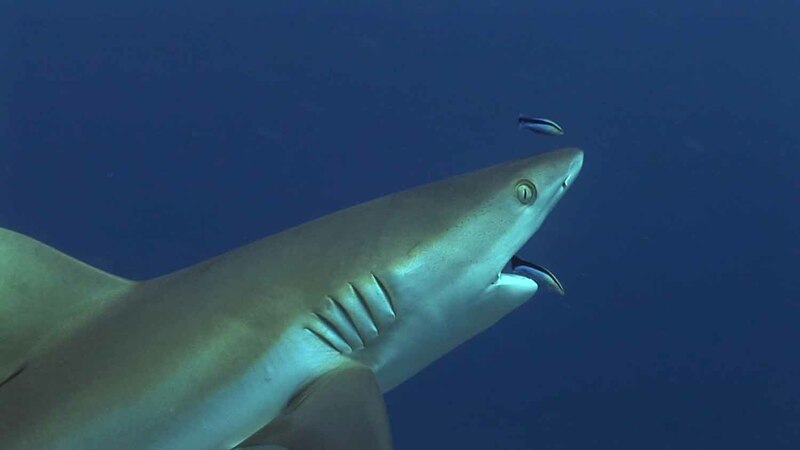 The fish eat the parasites off of larger fish in a mutually beneficial relationship. Cleaner wrasse are common but I've never seen anything like the shark dentistry before. The sharks queued up, waiting for their turn, swimming in place as well as they could, because sharks cannot stop moving. When their turn commenced, they swam over the coral knob and opened wide, sometimes rearing up nearly vertical against the current. The small wrasse swam into their mouth, among their teeth, in their gills. The sharks tolerated this treatment much better than I do my own visits to my dentist. They must have liked it because some of them, when their turn was up, swam to the back of the queue to wait another turn. I've been diving more than 500 times all over the world, but I've never seen sharks wait in line before. I digress. This post is really about amazing second-day wine. I toasted this remarkable dive with second-day Chandon Brut from Australia, which we purchased for $26 at the duty free shop in the official North Korea Nuclear Targeting Zone, aka Guam airport. This was not the first time I left for a vacation thinking that a couple weeks without wine would do me good, and then backslid. Before Pelileu, we spent eight days on Kosrae with our only wine a rather crappy southern French Chardonnay, and I had a craving. But Guam duty free's choices were bleak: mostly red wines, not my choice with the island diet of fish and rice, and mostly generic big brand sweet red wines at that. 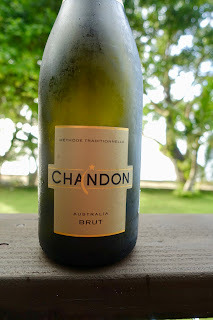 There was nothing I would buy when at home, but of course we weren't at home, so I decided that at least the Chandon was made by the traditional method from Chardonnay and Pinot Noir, and how bad could it be? The first night, it wasn't bad: it was just meh. We drank it on the terrace at Dolphin Bay Resort with a meal of island greens stewed with pork, glass noodles with dried fish, beef wontons and rice. It was the perfect pairing, as it was cold and bubbly, and those are my tasting notes. It had just about no taste. I assumed that was all it could offer. Boy was I wrong. The story could end there, but for my wife, whose packing differs from my own. I pick out clothes and shoes and the needed dive gear and throw them in my bag. My wife requires an hour to unpack at each new island, finding a spot on a ledge for innumerable things I would never think to transport on, by the time we got to Pelileu, five separate flights: plastic spoons and forks; takeout packets of soy sauce. Not content with my Swiss Army knife as a corkscrew, she brought an actual corkscrew from the Burgundy Wine Board, which I used to drill into a fresh coconut. At home, I would have written off the Chandon as flavorless and poured it down the drain (the privilege of someone with too many wine samples), or maybe my wife would have enjoyed a mimosa. But in Pelileu, it was still the best bottle of wine we were going to see all week. So I plugged it with the unexpectedly useful Champagne stopper and put it in our mini fridge. After returning from our astonishing shark dentistry dive, on which we also saw a manta ray and schools of barracuda and several turtles and even without all those highlights enough fish to make it a great dive, I sat on our porch watching the waves roll in and thought, I'll have a coffee mug of that generic flavorless bubbly, to toast the experience. Hallelujah! A day after opening, the wine was transformed. It had the nutty, smoked caramel flavor of fine aged Champagne. The fizziness was more subdued, and probably it was oxidation that brought out the fine character. I was and remain amazed. I have never had a wine transform so completely for the better after a night in a fridge. Earlier this year I was challenged by a Canadian making Chardonnay on the Sonoma Coast to leave his wine open on my kitchen counter for several days to see if it improved, and it did. But that wine was at least interesting from the beginning. To compare the Chandon's transformation to the famous transition to color in The Wizard of Oz would be underrating the visual appeal of The Wizard of Oz's black and white scenes. I may spend the rest of my life recorking sparkling wines and wondering if I will ever taste the like again. Perhaps like the shark dentistry, it will live only in my memory. Thanks for the tip on Pelileu. As a fellow diver, albeit a mere novice by your standards, I will add Pelileu to our diving bucket list. I used to teach a sparkling wine class on a fairly regular basis and I was always impressed by how well the wines tasted days later after being stoppered and refrigerated. I don't remember any transformations like to one you described, but the wines held up wonderfully, much better than still wines.